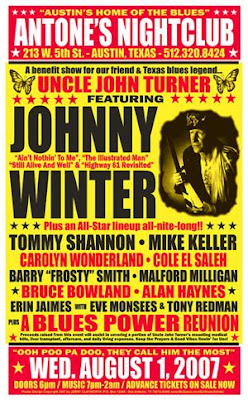 More on Uncle John... and Johnny and Edgar Winter live in New York! More on Uncle John: A few more cool photographs from the Uncle John Turner benefit gig that Johnny played at Antone's in Austin, one of two that JW played for his former bandmate. There's an autographed drum you won't forget, Johnny jammin' away before a packed house, and Paul Nelson and Tony Beard iin action. Click here to check out the action, and also to view tour dates for September and beyond. The latest: Looks like Johnny and Edgar will each play two sets on Saturday, September 15 at B.B. King's in Times Square. The first show, according to the club's Web site, is sold out. Be sure to check directly with the club for showtimes and ticket availability.